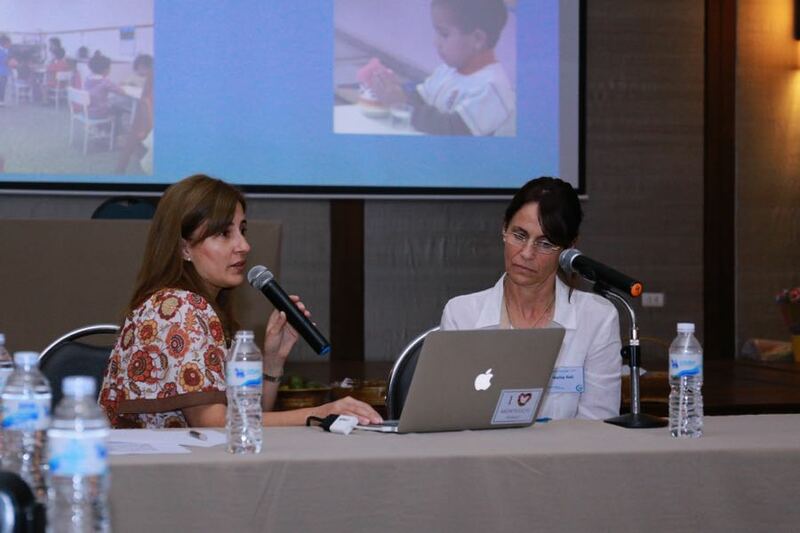 Constanza Carballo and Marisa Sioli presented the inspiring work of Fundación Argentina Maria Montessori (FAMM). They presented the facts regarding the Montessori movement in Argentina and this highlighted the success of their work. Maria Montessori visited the country in 1926 and her work was well known. However only one Montessori preschool existed when FAMM began it's work in 2007. FAMM has helped establish 10 private preschools, 12 projects serving children at risk, 2 pilot projects in the public sector, 8 Montessori initiatives in poor communities partnering with NGOs and parent workshops for illiterate parents. FAMM is the one of the few Montessori Training Centres in South America and attracts teachers from other countries as well as Argentina. Prisoners make materials for Casa del Niño and an ex-prisoner delivers the materials and furniture. The work of the Catechesis of the Good Shepherd has involved the priest from the Pope's congregation so the work of FAMM has now reached the Vatican. FAMM has built strong partnerships with the Teacher's Union and the training centre is now looking at training for secondary schools. Cathy (Jiugiu) Zhao is a 3-6 Montessori teacher in Beijing. She has done much work in translation for Montessori in China. Her presentation featured the work of the Montessori Volunteers Association, where AMI graduates dedicate their time to various social projects. Jennifer Moore told the story of Coffee Bay in the eastern Cape, South Africa. Her own story, spanning 27 years of Montessori was woven through the presentation. The Ikahya Labatna Montessori school is only 5kms from the nearest town, but is an impoverished community set in farmland despair surrounded by great beauty. Home life is steeped in tradition and there are few basic services. The school was granted from village chiefs and is government funded. Dawn Bruschen founded the school and a number of other educational projects. Gail Cresswell spoke of the 0-3 Early Learning Centre at Mowanjum, West Kimberley, North-Western Australia. This project began in response to a request from the old women to work with the young children and mothers. Mowanjum community consists of three language groups, Worrora, Ngarinyin and Wunambal people, removed from their homelands and relocated, finally at new Mowanjum on Nykina Land. Gail's work has focused on establishing relationships with the community, working with the 0-3 years children and adolescents.